Live video streaming was used till recently by only big businesses. But now the availability of some new apps and smartphones made live streaming easy for businesses of all sizes. Periscope and Meerkat are free live streaming apps which are now popular and the businesses are using these to engage the audience. The activity of Live Video for Business is explained here. Live streaming allows the businesses to tell their story in real time to the right people at the right time. The businesses can provide the consumers what they demand – the transparency and accessibility through live streaming. Live streaming is cost effective and works great for reaching and engaging the customers. 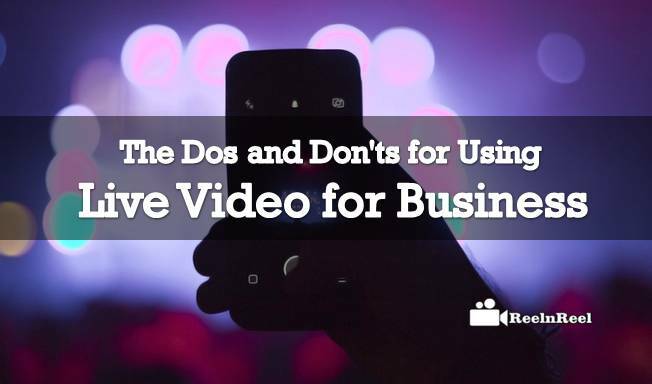 There are few things that they have to do and those that they should not do while using live streaming for business promotion. Connect with your viewers by interacting with them. This can be done talking to the camera or through chats. The viewer will feel great if you let them know that you are willing to talk to them. While live streaming, there is no need to stick to one topic. Make things interesting to the viewers by talking on various topics that are related to your business. Increase audience engagement using question and answers, surveys, polling etc. This helps to keep the audience watching your stream. Your followers will love to know about the events, product launches and will love to watch the events live. Oblige them by live streaming your exclusive events and product launch parties. Make the live streaming interesting by showing the viewers chats with industry bigwigs etc. Live question and answer sessions will give the opportunity to give the feeling that your people are readily accessible. Behind the scenes live streaming videos are another sure shot way to gain the attention of the consumers. Show them how your products made. If your business is to offer services, show the viewers what your day-to-day in office looks like. Live demo of your products can be showed on live streaming. The viewers can know how it works and makes sure that the video feels unrehearsed and real to the viewers. Make sure that your live streaming is accessible on various devices such as mobile phones and tablets also. Let your viewers re-stream your videos so that the reach expanded. Get instant feedback from the consumers by asking questions about your product or service. Do not change the day and time of your live streaming event. Let your followers know when you will be broadcasting. Be consistent with the day and time. If you change the day and time, you will lose the viewers. Do not overlook the audio quality aspect. Apart from having good quality video, it is also important that the audio is good. Not testing your equipment before the event should be avoided. Test all the equipment before starting the live streaming to avoid any problems in streaming. No two businesses are alike. Do not simply follow what your competitors are doing with live streaming. Make your live streaming unique. Community discussion, interviews and behind the scenes are few types of content that the businesses can create with live streaming platforms. Don’t just decide live streaming without determining the audience. Live streaming is going to become more and more popular. We are going to see more and more companies using any of the platforms such as Facebook, YouTube, Periscope and others for live streaming and take advantage of these powerful tools for their successful video marketing in the coming days.